ALLEGRA BOVERMAN/Staff photo. Gloucester Daily Times. 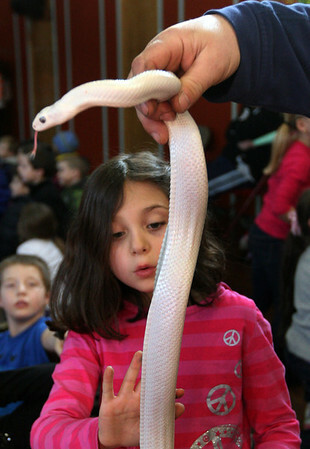 Gloucester: The Cape Ann Vernal Pond Team paid a visit to Beeman Elementary School on Friday afternoon and brought many snakes with them to demonstrate and talk about with the students and staff. Second grader Olivia Amaral carefully touches an albino Texas rat snake held by Jonathan Bevins, a volunteer with the team.